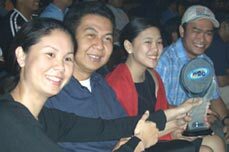 Liberal Philippines online version: www.liberal-philippines.com bested more established and prominent online magazines to win the People’s Choice for the second time in the Magazines and Zines category in the 7th Philippine Web Awards held last November 23, 2004 in Makati City. On hand to receive the award were: Editor-in-Chief Con-Con San Antonio, Associate Editor Essa Remoquillo, Web Developer Narwin Espiritu, Marketing Manager Alexandra Cuyegkeng and board member and Friedrich Naumann Foundation Philippines Resident Representative Dr. Ronald Meinardus. The Philippine Web Awards is the highly anticipated event of the Web industry. It recognizes the best Websites and honors the teams behind them. This year there were 16 categories, and Websites competed for the two awards in each category: Best Website and People’s Choice. Best Website is judged by a panel while the People’s Choice is determined by the number of votes sent in by the internet community either through online voting or SMS messaging.